Let it snow, Let it snow, Let it snow! Celebrate winter at PWELC with fun outdoor activities for everyone in the family. Try cross country skiing, snowshoeing or kicksledding. 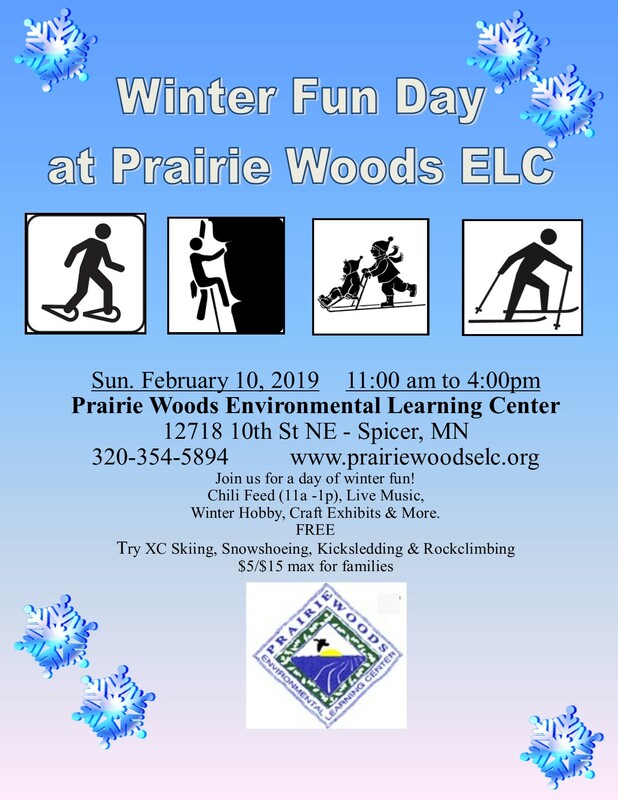 Indoors, enjoy a bowl of chili, warm up by the fire, listen to live music, check out over 30 exhibits of winter sports, hobbies & pastimes, or try your hand at the climbing wall. Click here to view the poster. Cost: Free for chili feed, live music, winter hobby booths. $5/person, ($15 max/family) to xc ski, snowshoe, kicksled & climb on the indoor rock climbing wall. Please call if you are interested in sponsorship opportunitites, volunteering, or exhibiting at Winter Fun Day. Reminder: "We want your shoes!" We will be collecting shoes at Winter Fun Day for our WorldWear fundraising project. Used running shoes, leather shoes and leather-look shoes are needed. Shoes must be clean, have no holes and be in wearable condition. Call if you have questions- 320-354-5894. THANKS! !